What’s the best cake to make in the summer? Ice cream cake, of course! And this one’s got it all – a chocolate brownie cake base, layers of chocolate ice cream, chocolate fudge sauce, and some homemade chocolate whipped cream to finish things off. Plus, some store bought brownie chunks for decoration. Because you can’t always make everything from scratch. You’re only one person after all. This cake has been on a bit of a journey (cue sad X Factor music). It started out as an idea in my head for a mint chocolate chip ice cream cake, with layers of mint chocolate chip ice cream, chocolate ice cream, mint chocolate sauce, and even some mint Oreos thrown in there too. But for some reason, my local supermarket just won’t deliver me mint chocolate chip ice cream. I checked on there week after week, and I just couldn’t get any. You might say – ‘Charlotte, why didn’t you just leave the house, go to a different shop, and buy some there? There’s a shop a mere 5 minute walk from your front door that sells chocolate chip ice cream’. Well, yeah, there is. I went there yesterday to buy the brownie pieces for the top of this cake. But that’s not the point. So, I had a re-design. Less mint, more brownie. Because isn’t everyone’s favourite ice cream really Ben & Jerry’s Chocolate Fudge Brownie? 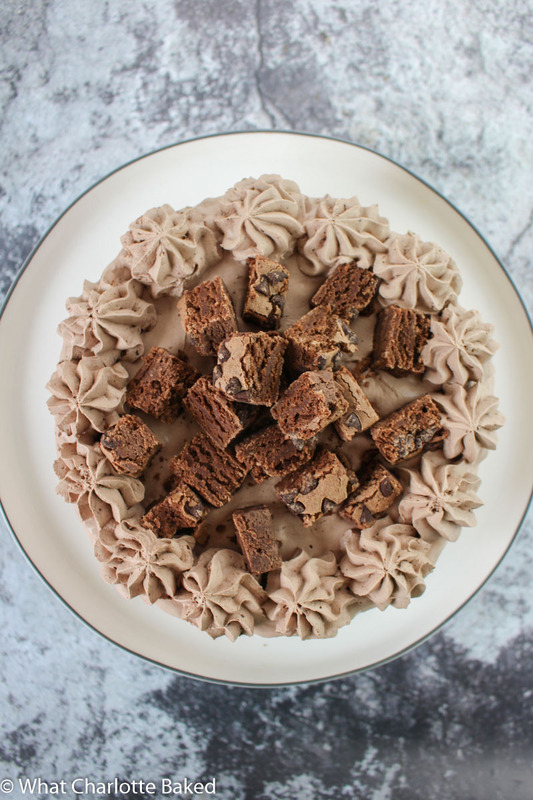 And so the Chocolate Fudge Brownie Ice Cream Cake was born. True story – there’s no actual Ben & Jerry’s ice cream in this cake. There could be, if you wanted, but it’s not really necessary. Just buy some supermarket own brand chocolate ice cream – there’s enough brownie in the base and on the top to more than make up for it. If you’re interested, I used this one from Sainsbury’s. The base of this ice cream cake has also been through a bit of a drama. 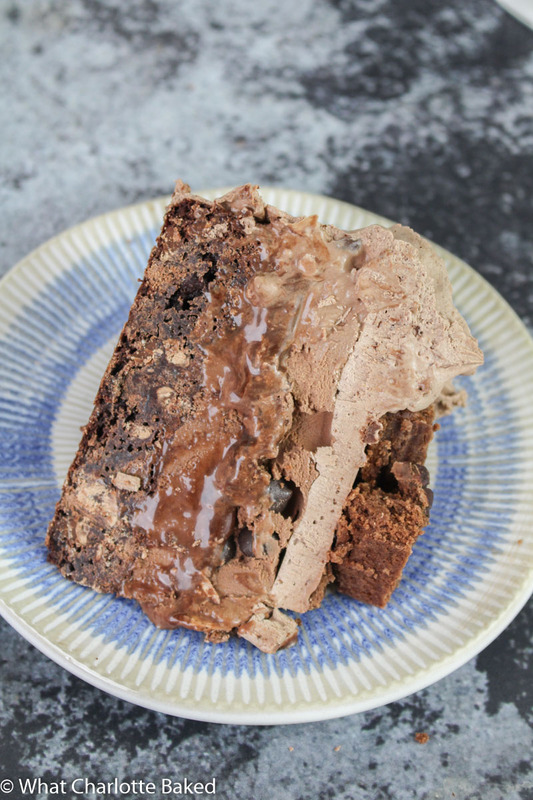 The cake you see before you uses my chocolate brownie recipe as the base – BIG MISTAKE. Although this makes great brownies, it also is too dense to make it easy to cut once frozen. It took me so so soooo long to chisel my way through to get the photo below. Don’t do it. Instead, the recipe below uses a much more cakey brownie base, that’s a lot lighter and easier to cut through frozen. It’s adapted from this Martha Stewart ice cream cake, and is a much better choice. When you’re ready to serve this cake, remove it from the freezer about 10-15 minutes beforehand, depending on how warm your house is. It makes things a lot easier to cut through – especially if using a knife that you’ve warmed up under the hot tap, and dried off before cutting. And don’t be scared off by the homemade chocolate fudge sauce in the recipe below – this is the easiest thing in the world to make! You should definitely double the quantity, and keep some of it in the fridge for later. Just warm it back up in the microwave, and pour it all over some vanilla ice cream. Add some sprinkles, chopped nuts, and a cherry, and you’ve got yourself a sundae my friend. A chocolate brownie cake base, covered in layers of chocolate ice cream, chocolate fudge sauce, chocolate chips, and chocolate cream. 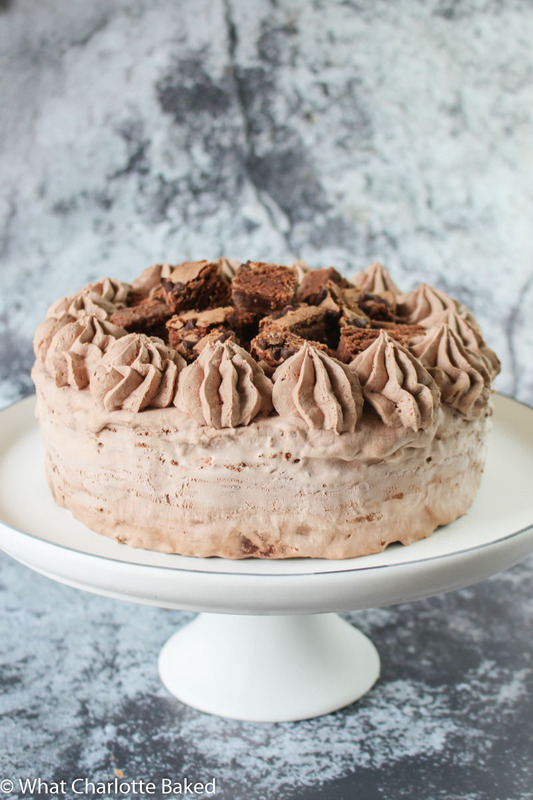 This cake is a chocolate lover's dream! Preheat your oven to 190°C / 375°F (170°C fan), and grease and line the bottom of an 8 inch round springform cake tin with baking parchment. Set aside. Melt the chocolate in the microwave (stirring ever 20 seconds) or in a bowl over a saucepan of boiling water. Leave the melted chocolate to cool whilst you make the rest of the cake. Beat together the butter and sugar in a large bowl, or in the bowl of your stand mixer, until light and fluffy. Add the egg, and beat again well. Sift the flour, cocoa, salt, and baking powder into the bowl, and fold together gently until just incorporated. Add the milk, vanilla extract, and mix gently until completely combined. Pour the batter into your lined cake tin, and spread the top out flat with a spatula or the back of a spoon. Bake for 15-20 minutes, or until a skewer inserted into the middle of the cake comes out with some crumbs and a tiny bit of batter on it. Remove from the oven, and leave to cool completely in the tin on a wire rack. Melt the chocolate in the microwave (stirring every 20 seconds) or in a bowl over a saucepan of boiling water. Once completely melted, transfer to a small saucepan, and add the sugar, salt, butter, cream, and vanilla extract. Mix together, and then heat on low-medium, stirring frequently, until the butter has melted, and the sugar dissolved. You can test this by rubbing some of the sauce between your fingers to see if any sugar grains remain - make sure not to burn yourself, but the sugar should dissolve well before the sauce gets too hot. Once ready, set the sauce aside to cool for later. Carefully remove the brownie cake from the tin. Re-line the bottom and sides of the tin with baking parchment - do not grease. Carefully place the brownie cake back into the lined tin. Remove half the ice cream from the freezer and leave out at room temperature for 10-20 minutes until soft enough. Pour the ice cream into a bowl and mix with a spoon until it is a spreadable consistency. Spoon on top of the brownie cake, and spread out using a spatula or the back of a spoon until the ice cream reaches the edges and is flat on top. Place the tin in the freezer for at least half an hour. Once the ice cream layer has mostly set, pour the chocolate fudge sauce on top, and spread out flat. Return the cake tin to the freezer for half an hour or so, until the chocolate sauce has mostly hardened. Add the remaining ice cream on top of the chocolate sauce, but this time mixing in the chocolate chips when stirring the ice cream. Make sure the top is as flat and level as possible, and then return the tin to the freezer for at least four hours (or overnight if possible). Once completely frozen, remove the cake tin from the freezer. Release the springform tin from around the cake, and gently remove the baking parchment. Pop the cake in the fridge whilst you make the chocolate cream. Place 600ml (2½ cups) of double or heavy cream into a large bowl, and sift in 60g (½ cup) cocoa powder and 60g (½ cup) icing sugar. Whip using an electric hand whisk until stiff peaks have formed. Remove the cake from the fridge, and place on a cake board. Frost the cake with the majority of the chocolate cream. Pipe rosettes of the remaining chocolate cream around the top of the outside of the cake, and fill the centre with chopped brownie pieces. Serve the cake immediately, or return it to the freezer until needed. Take the cake out of the freezer about 10-15 minutes before you are going to cut it. The cake should stay fresh for up to a week in the freezer - although it may last much longer than this, depending on the ice cream you use and how cold your freezer is. Can anything ever be better than chocolate?